Hello Nosh Show Listeners! It's days like today that let me do some generic junk food blogging instead of the specific frozen stuff we usually cover. Everything in this first picture we talked about on the show, but I've got a few other things that I would like to recommend after the break! Ok, we'll do this quick since some of it's covered in the show. Cinnamon Frosted Flakes are ok, nothing special. 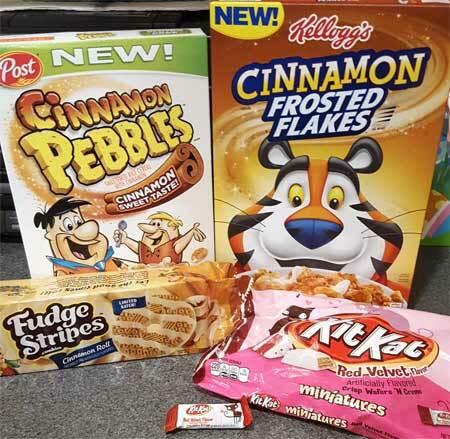 If you love frosted flakes but want to mix it up a smidge, then sure, try a small box (not the family size!). Otherwise, I would not go out of your way for them. Red Velvet Kit Kats are tasty and I say feel free to try them. It's got that kit kat "krunch" to it, but it's also reminiscent of a hershey's cookies & cream bar in terms of texture. We are actually on our second box of Cinnamon Pebbles.The first was this small 11oz box from Target that is basically only good for one batch of rice krispy style treats. I actually did pick up a 15oz box from Walmart after we recorded the show for a second batch of treats. That batch went with a 3 cinnamon pebbles to 1 frosted krispies ratio and I think I nailed the ratio... but then my son chimes in with "I think I liked them better the first way". I say pick up a box and have fun with them. 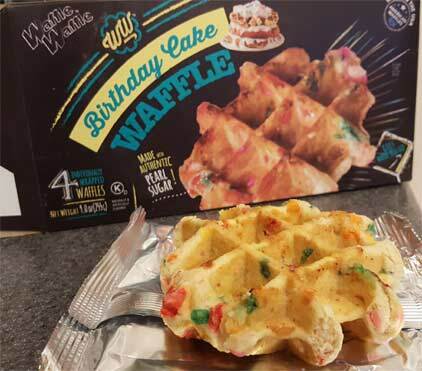 When the Impulsive Buy did a spotted on shelves for the new Waffle Waffle flavors, I just thought about the fact they had more flavors and totally spaced out about the black packaging refers to their new grab n go status. I picked up the birthday cake flavor first and definitely enjoyed them. It's not that they are amazing or blasting with flavor, but I've always loved waffles and to have them in such a convenient, eat any time single serve packaging is great. Keep in mind that I will snack on a piece of plain bread, but these are fun, so fun that I stopped and grabbed the cookies n cream version on the way to work today. They are also quiet tasty. If you've hesitated no trying waffle waffle, give these new non-frozen versions a try. Well, at least if you don't mind a dollar a waffle (aka I need to resist the urge to grab a second one when I eat them). 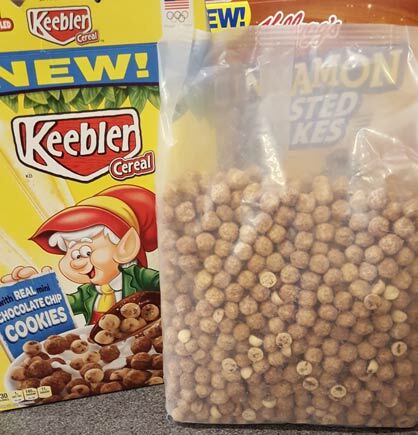 It seems like the general consensus is that the new Keebler cereal is a disappointment as a cereal, and maybe it is, but has anyone gone in to it treating it like a snack? I was fairly scared off from trying this cereal by reviews and pulling the bag from the box makes me realize why people were dismayed at the lack of chocolate chip cookie flavor (you can barely see the tiny cookie bits in the picture above). That said, I went in with crazy low expectations and was surprised how delicious these are. Ok, maybe delicious is too strong, but these are good like cocoa dusted KIX or Trix. The chocolate puffs which make up 90% of this box are just a delight to snack on. I dont even care about tossing these in milk because I'm having way to much fun just downing them straight from the box. 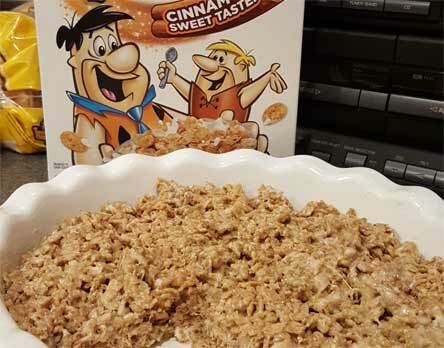 So, which new cinnamon flavored cereal was better, Cinnamon Frosted Flakes or the Cinnamon Pebbles?